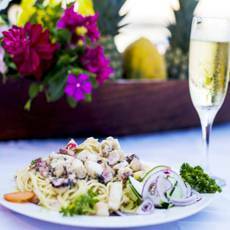 Our restaurant on the sea boasts exceptional food, delicious and exotic frozen drinks, as well as wines, beers and sodas, friendly service and ample and magnificent views of the sea. Feel caressed by the Caribbean breeze on our platform with a ladder to the sea. It is the perfect place to sunbathe, cocktails, meals and catch up with a good book. We buy our fish and seafood from artisanal fishermen, and meat and poultry at the local market, which allows us to offer the best quality in the delicious food you receive at your table. 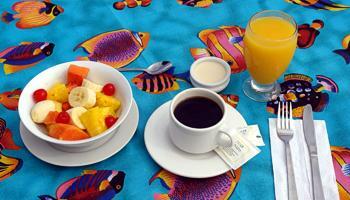 Delicious continental breakfast, Creole or a la carte. Coffee, tea, chocolate. Fruits, Juices, Cereals and Pancakes. Specials of the day (only at lunch). 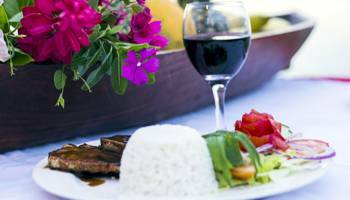 A la carte menu that includes fish and seafood, meat and chicken. Wines, beers, soft drinks and desserts. 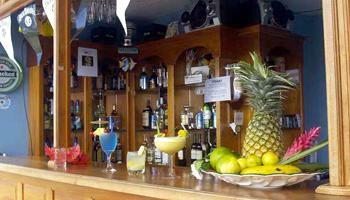 We offer different drinks, national and imported liquors, cold beers and wine. Enjoy our happy hours from 4:00 pm to 7:00 pm.